Firstly - if this is wrong place to post then please let me know and I'll relocate (still getting use to the forum layout). As mentioned in my little welcome to the forum I'm looking at getting back into model railways after a good number of years out of the game. 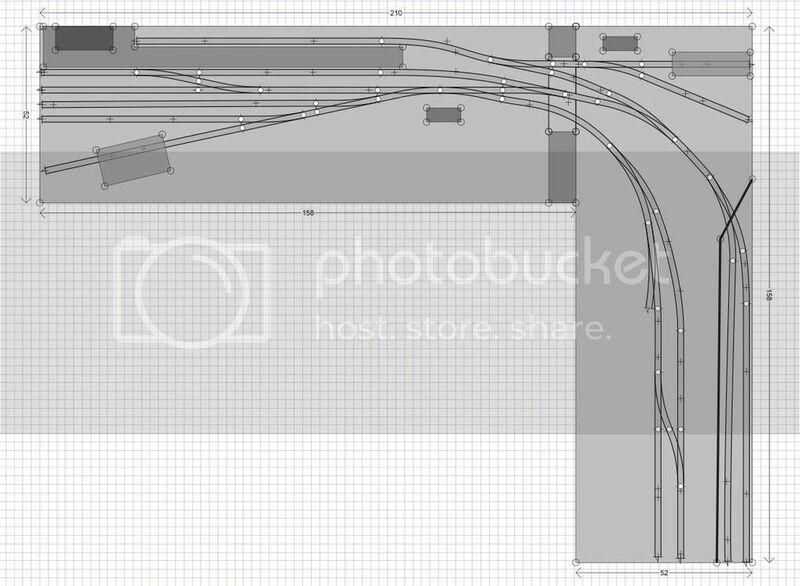 I'm now looking for a longer term project with challenges so I'm now looking at building my own layout with DCC in mind. Thinking L shape arrangement with the possibility to extend it in the future with a branch line-esque feeling to it (Southern/BR). 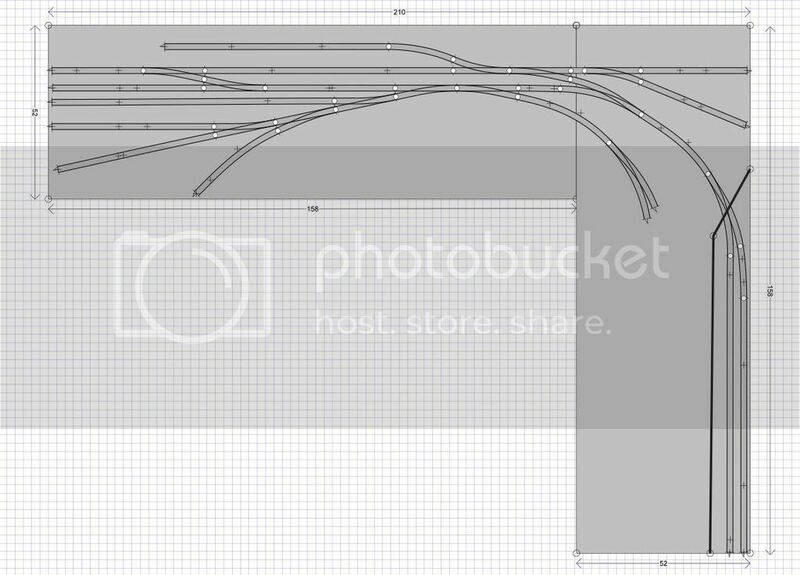 As I had some time free over the weekend I had a go modelling my potential layout with AnyRail (see below). Due to the need for it to be able to be moved (spare bedroom/loft) I'm kind of restricted by those dimensions. The area in front of the fiddle yard is to be some kind of industrial area? From the above picture I'm planning on having a station in the top left hand corner, single engine shed to the top right hand corner and goods shed in the lower left hand corner. There's a small 2 lane fiddle yard hidden away. I'm not planning to run big engines and the max at the station will be something the tendered engine and a couple of coaches / 2-3 coach DMU. The rest of the layout is for shunting. Before I continued my designing I was just wondering if anyone could point any potential problems they see as I haven't designed a layout from the ground up before. Also if anyone has any ideas I would love to hear them too. There are a few things, zeffico , that caught my eye. I'm assuming the points are electrofrog, but the one to the bay platform looks sharper, as though it might be a Hornby or Setrack one. Intended? The space between the bay platform face and and main one may be a bit narrow. Anyrail has platform pieces under "Object Libraries: Hornby," which may help. Front left, you have three reasonable sidings, but I suggest that rather than the 4th short curved one, losing it and its point would let you add a point's length to the two next sidings, to possible better effect. At the station throat, while you have inserted a short straight to avoid one point being across a joint, you have left a second one doing just that. If that can be avoided, it would be usual to do so. The narrow fiddle yard is fine for handling DMU's but depending on the height of the backscene, lifting a loco (and brake van)?) to get it to the right end for the return trip might be awkward. Having a fiddle yard that is perfectly accessible and perfectly invisible is the impossible ideal. Finding the most acceptable compromise is a matter of balancing choices. A 3 track sector plate might do better here. Only a might. Hi Chris, thanks for your feedback. I really appreciate it especially as this is my first attempt at any layout design. 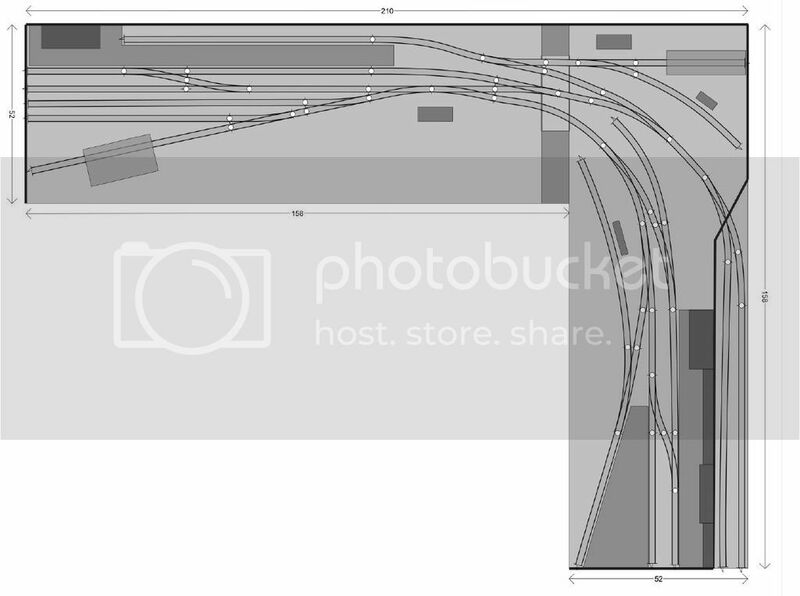 Your correct with the electro frog and your eagle eyes noticed the Setrack used at the station though I'm debating to change this to one to go with the rest of the layout as well as moving the point that is staggering the baseboard joint. I'll check out the object libraries part of AnyRails to help me out with the setting out of the platform. I haven't decided on the height of the back scene yet though wasn't going to be too tall - possibly a foot tall? The fiddle yard width might increase subject to what I do with the space in front of it though I am leaning towards having this area surrounded with retaining walls with a tunnel mouth to the fiddle yard. 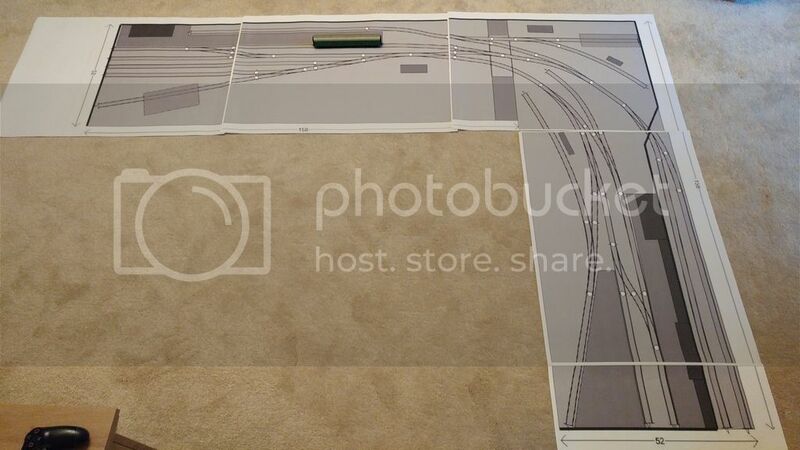 This will allow me in the future to change the fiddle yard to a tunnel if I extend the layout. Just got to think about the transition from the station area to industrial area. Again thanks for the pointers, much appreciated. How about a raised road coming across the board at the start of the fiddle yard? It could have 2 or 3 arches (or short girder bridges) on the station side, only the rearward track doesn't re-appear on the other one. Height of that wall / low relief buildings is to taste, and may well depend on whether you intend to operate the layout standing or seated. A mirror above the layout could give a vertical view of the the fiddle yard. I have a (simple) sector plate design suitable for manual remote control so regular reaching over the concealing backscene need not be necessary. For the industrial part, can I suggest using the small Y electrofrog SL-E197 throughout to give the industrial part a different character from the main railway? Taking in a view of your points from your first post I put together this slightly revised layout last night along with some building locations added. Its still a work in progress but your help has been greatly received for my little project. I'm thinking of placing warehouse buildings like the Metcalfe brewery / small factory / warehouse kit along the fiddle yard wall to hide the area behind along with help setting the scene for this area. As you can see I've placed a bridge along the baseboard joint helping to act as a transition feature between the 2 areas. I was thinking of the bridge at 90 degrees to that one, to cover the start of the fiddle yard, but this is solidly in the area of personal choice, so whatever works for you, works. If the wall in front of the fiddle yard is a foot tall/Metcalf warehouses it'll be too tall for you to do any "fiddling" unless you have access to the back! It would be fine for running DMUs in and out but would be useless for any loco hauled trains. I also think two roads is not enough, three minimum. I'd be tempted to forget the sidings on the fiddle yard board and just have a plain headshunt instead, bringing the fiddle yard round at a diagonal from where it enters than board to the bottom left hand part of that board and leave the rest of that board to scenics. That would give you more space to add more tracks to it and either a sector plate or points for a run-round. B308 - I should of said that the fiddle yard will be able to be access from the back. As I'm not planning on having many engines on this layout I kept the fiddle yard to a minimum in size (Probably going to have a DMU and my 'Thanet Flyer' parked in it most of the time). Good shout about the height of the Metcalfe kits. What I might have to do is get a couple and customise them. The reason I'm keeping the height down is when/if I need to move the layout I can place in my loft as well as fitting in the car (large saloon at the moment). I had another play again last night and tweaked it slightly in places as well as adding a little more layout detail. As the baseboards are fixed size wise I'm looking at grabbing the materials over the weekend for it. Can I ask what your plan is for the large kick-back siding in the industrial area? It almost seems to reduce capacity. An alternate would be to replace it with a short spur facing the other way, as home for a "yard engine". The two loco release points could then be omitted, and the yard loco could handle that for any loco arriving head-first with its train. Hi Chris, I'm planning on using that as a little siding to store the odd single truck or two when not in use. Nothing special and probably be modeled overgrown. I placed that siding there to fill up some space in that area along with another siding to add stock too. I did try and do something similar to what you suggested but my points ended up on the joint of the baseboards hence what you see now. I'm still tweaking this area so watch this space.